The John Frieda® brand has been known for transformational styling for over 20 years. The new John Frieda® brush range - just launching in Australia - is very much part of this transformational, ultra-sophisticated sleek and shiny story, adding to the John Frieda® tool bag that allows salon sleek to be achieved at home easily and with dramatic results. So how do they work? All John Frieda® brushes have been designed with deep-shine silicone strips - these smooth the hair with each stroke creating shine and smoothing flyaways, all the while helping to reduce frizz. The silicone is ultra-hardwearing, which means it will last for the life of the brush, so hair shines and shines. The John Frieda® brush range is also made with tourmaline (100% crushed gemstones) that release natural IONS for intense shine. IONS work by helping to flatten the hair's cuticle layer, increasing shine and helping to reduce frizz. The John Frieda® Paddle Brush: $29.95 and The John Frieda® Cushion Brush: $29.95: Both these brushes come with flexible cushion bases that allow you to gently untangle wet or dry hair. They are designed to achieve a sleek finished look and are the perfect brushes to use in conjunction with the new John Frieda® Styling Tools range - in particular with the John Frieda® Sleek Finish Straightener if you want to try your interpretation of the 'new-look straight' or with the John Frieda® 'Loose Curls' Curler for sleek curls and waves as seen (and very much coveted!) on 2012 runways. The John Frieda® Vented Brush: $26.95: Use with the John Frieda® Salon Shine hair dryer. The vents let the airflow from the dryer reach your hair for faster drying and styling. The John Frieda® Large Round Brush: $29.95 and Small Round Brush: $29.95: Use with the John Frieda® Salon Shine hair dryer to make for a dramatic blow dry. 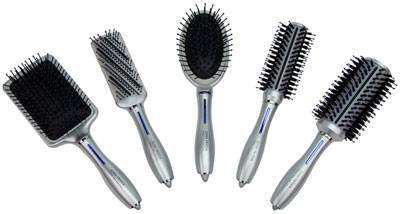 The combination of the boar and nylon bristles distributes the scalp's own natural oils for added shine and smoothness. Use the Large Round Brush to straighten curly or wavy hair and the smaller one to add volume or curl. The John Frieda® brush range is available nationally through Priceline.